The Complete Idiot’s Guide to Playing Percussion – You’re no idiot, of course. You know that you have to do more than bangs things together to create percussion music. Whether you’re expanding your percussion skills or writing for the percussion section, you need to know about dozens of different instruments – how they work, what they sound like, and how they’re played. 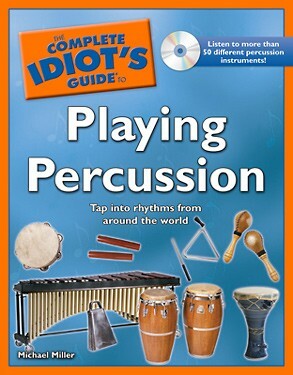 The Complete Idiot’s Guide to Playing Percussion takes you on a guided tour of the entire percussion family, from drums to cymbals to mallet instruments and more. A unique audio CD demonstrates each featured instrument – and shows how you can incorporate them into musical compositions and programs. Softcover Book approx. 8.5″ x 11″ and 243 pages. Percussion Books and more at DRUM BUM!